By lunch time – I’m flustered, regretting I work in this place and sputtering bitterness all over folks. Jesus comes around to the side of the building where my cubicle is located. He looks up from the ground trying to get my attention but I can’t hear him; my focus is on my problems. ***I know someone can say amen to this. Spring is in the air and it’s the perfect time for our May special. Our May special is great for graduates and anyone that drives a car. 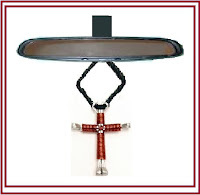 Our May special is a cross that goes around the mirror in your car. With this special you will receive a solid color cross of your choice that is the perfect size for the mirror in your car. The cost for this special is $5.50 and that includes shipping in the US.